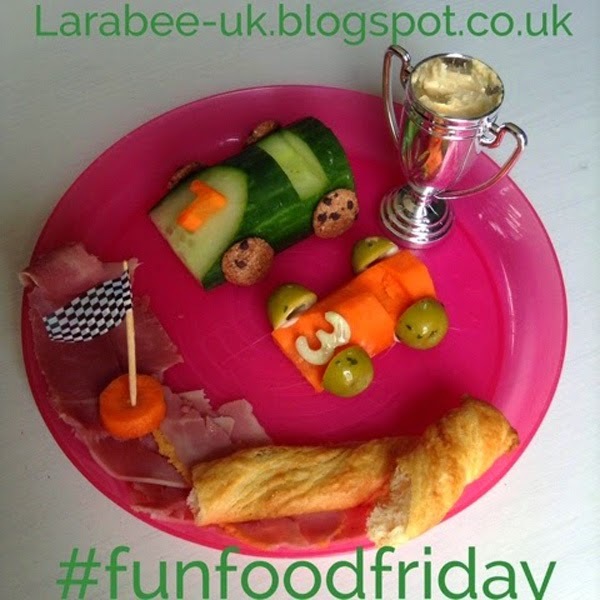 A little racing car lunch for this weeks fun food Friday, I created 'cars' using cucumber and carrot, when I asked T what he thought they were he said 'I don't know' - great! Thanks for that buddy! The wheels on the carrots are olives attached with a little mayo and the ones on the cucumber are cookie cereal. There's no relevance in the numbers 7 & 3 I just used cutters which fit the vegetable leftovers. No supplies here really, apart from the trophy which holds the hummus, these were from Sainsbury's, we originally got those for our football sensory tray. I'm linking up to #funfoodfriday with Grace at http://www.eatsamazing.co.uk. These are so cool! Such detail as well!